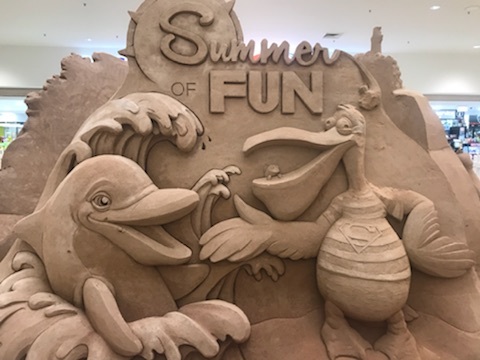 Sand Sculptures are a wonderful, interactive and versatile activation for your Shopping Centre – perfect for School Holidays, Christmas, Easter, Halloween or any special in centre promotion. 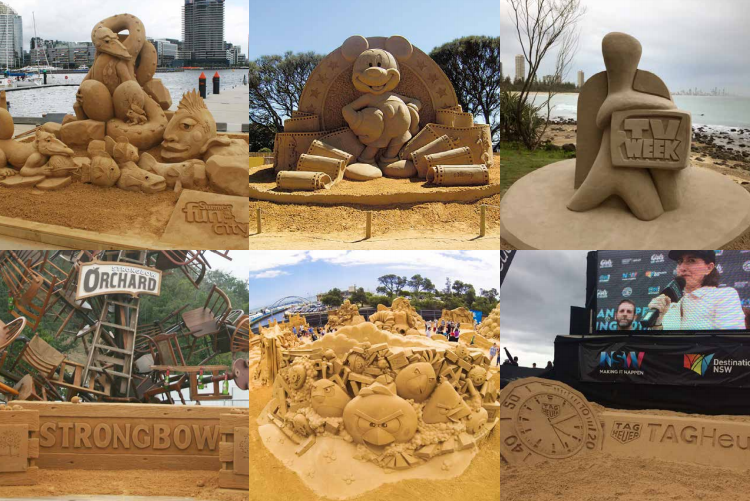 Sandstorm Events can work with you to create your own bespoke, customised stand-alone sand sculpture, sand sculpture trail or interactive sand sculpture. Simply add to this one of our themed sand related children’s activities and you are set. Can be priced to suit most budgets. We can help you create a truly special bespoke Christmas installation that will engage your shoppers during this special time of the year. Shoppers can join in the Christmas spirit and watch much loved Christmas tales come to life in an interactive sound and light sand sculpture show. We can create a spooky Halloween sculpture for you using either sand or pumpkins or set up children’s craft zone with specially designed Halloween sand art or sand bottles. Our customers loved the Sand sculpture and the Sandsation workshop. The whole experience has been wonderful and we have loved having you here. I will definitely consider having Sand Storm Events back at CS Square. Thank you to you and the team for a great promotion we are still collating our results and I will send you through a copy of the summary but a quick snap shot - we were up +0.06% in traffic for December and 2.7% in sales which considering the forecast was to be down 10 -20% (due to the 2 competitive centres opening their developments) we are ecstatic! In addition the promotion has raised just over $23,000 for Surf Life Saving North Coast which will be spent on providing each of the 8 clubs in the region with professional surf patrol message boards to warn the public of the surf conditions at each of the 8 beaches, plus additional sun protection tents for the clubs. Sandstorm Events have created great looking sculptures for our clients. In the process, they have also made us look extremely good. 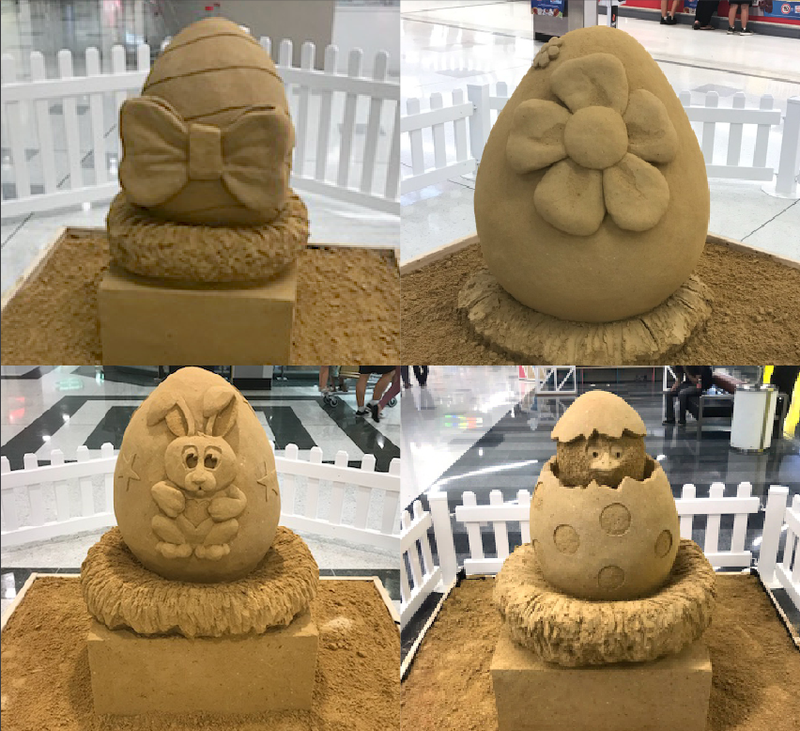 Narellan Town Centre has used Sandstorm Events for multiple Centre events in the past including a Sand Sculpture Easter Egg Hunt for Easter 2018. We were blown away with Sandstorm Event’s professionalism as a company as well as the quality and creativity in their work. Our customers were blown away with the sculptures with many of them stopping to admire and take photos. We can’t wait to have Sandstorm Events back to the centre in future! Visit our FAQ page for all the additional information and videos. Follow along on our socials for current information and specials in your area! Sandstorm Events are proud to announce our new online Sandsational Sand Art shop is now live! You can purchase sand art pictures for school fetes, parties and gifts. Click here.